Spa Esprit Group unveils Drunken Farmer, a travelling pop-up bar concept that will champion natural wines. Combine two fun and relatively new concepts in F&B and what do you get? A pop-up bar with natural wine, course. 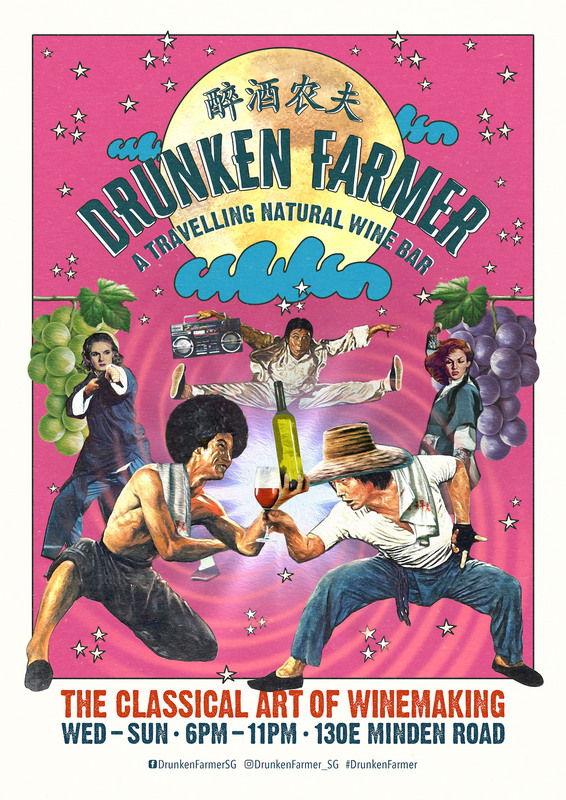 Drunken Farmer by Spa Esprit Group celebrates the natural wine movement by taking it on a travelling show-and-tell at various locations around Singapore. Think guest bartending shifts, but a natural wine version. Unless you’ve been hiding under the proverbial alluvial rock, you’d know that natural wine is the current in-thing in the wine world. It’s what helped cult wine bar WINE RVLT become what it is, and a recent theme at Wine Fiesta by The Straits Wine Company. And while there’s no clear definition for natural wine – unlike biodynamic wine or even organic wine – it hasn’t stopped intrepid consumers from exploring the world of responsibly-made, minimal intervention wines. If natural wine sounds a little scary to you, Philippe Chin, Operations and Wine Manager of Drunken Farmer says don’t be. “Most great wines appreciated by connoisseurs are, in fact, very close to natural with very little treatment or manipulation. They apply a minimalistic approach where they carry the grape hand in hand into a finished product with as little intervention as possible,” shared Chin. Expect some 90 different natural wine labels of white, red, orange, and bubbly variety from all over the world to pop up at various Drunken Farmer venues. A sneak peek of their menu reveals a number of natural wine gems. There’s Ochata Barrels from Basket Range, a burgeoning community in the field of organic wine set in Adelaide Hills, South Australia with its ‘Texture Like The Sun’ Pinot Noir, Grenache and Merlot blend, as well as the Riesling-based Christoph Hoch Hollenburger by the young Austrian winemaker. Or consider the Pascal Cotat Grande Cote from the Sancerre producer, whose region was making wine the natural way even before the term became hip. And while Italian Lambrusco is generally sniggered on, the DOC Lambrusco Salamino di S. Croce from Vigneto Saetti is a lightly sparkling red that will challenge perceptions about the Italian varietal. The first Drunken Farmer will pop up at Tiong Bahru Bakery Safari at 130E Minden Road starting 29 March 2019 and will operate Wednesday to Sunday, 6pm to 11pm.